I am back in Wellington, from a journey that feels like a rite of passage. With a friend I have mastered several things, most notably my fear of driving. I used to be a confident driver, until an accident. It was a moment of total loss of control, and I have tried to figure out what I could have done to avoid it, in endless self-accusations. I drove extremely slowly, and I did that because the road was slippery and very difficult to drive on. It was in the middle of the day, the car was in good shape, I did not fall asleep, I was not in a difficult curve. What happened was that the driving conditions were so bad my only option would have been deserting the car on the motorway and walking with my 4 year old daughter – a course I considered as dangerous as trying to reach the next exit. I never reached it though, the car slipped and I hit a car driving in the other direction, ruined my knee and disjointed a shoulder. Luckily my daughter was unharmed, but to this day I have never heard a more joyful sound than her healthy cries next to me. This happened 15 years ago, and I have relearned driving since then. I have accepted that I somehow did something wrong, perhaps made a bad decision when I pressed on and did not just abandon the car, and have worked hard to become a safe, careful driver who learns from mistakes. But I have perhaps been a little too safe, terrified of new roads, new situations and unknown potential for accidents. And with this background I got into a campervan in order to drive on the left hand side in a country I have never visited before. I am back in Wellington. I am alive. I have survived for a week, thanks to my own and my friend’s skill. 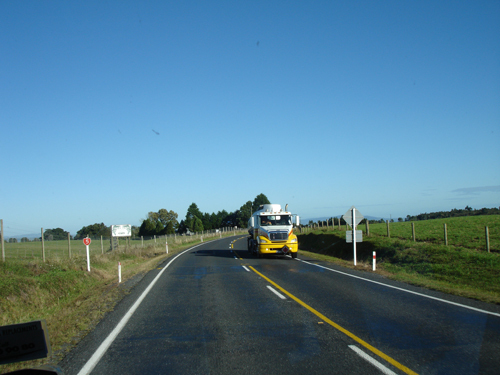 We did it, each of us, overcame the dangers of NZ drivers, speed-limits 20-30 kmph above those at home and a car that swayed and shook at every gust of wind, rattled at every little bump in the road, was despised by all other travellers and inspired those who overtook it to neck-breaking passings. We founds places to sleep, to eat, to park, to shop, we got to see what we wanted to see, and we slept safely each night in the frugal comfort of our narrow berths. We didn’t conquer Mount Everest or even try to climb the elegant slopes of Taranaki, all we did was soak in a spa and gaze at some glow worms. But I have conquered my own fear. I have taken back something I lost 16 years ago, the feeling of being independent and able to move about on the roads of the world. I relearned the freedom of private motorised transportation, at age 45. About time.